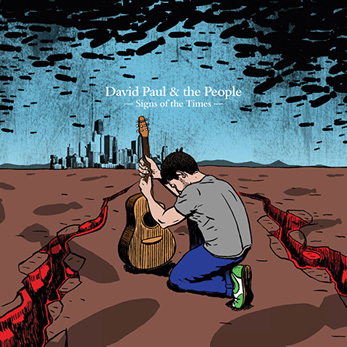 Signs Of The Times is the debut album by David Paul & The People. Having commenced recording songs for this album in late 2007, as his former band Beyond was dismantling, 'Signs of the Times' was a focused attempt by David Paul to make music that deals with everyday issues. Now with 12tribe records the band are about to release this album after much prayer to get this new band formed with David Paul at the helm. But what does this album sound like? Read More Signs Of The Times is the debut album by David Paul & The People. Having commenced recording songs for this album in late 2007, as his former band Beyond was dismantling, 'Signs of the Times' was a focused attempt by David Paul to make music that deals with everyday issues. Now with 12tribe records the band are about to release this album after much prayer to get this new band formed with David Paul at the helm. But what does this album sound like? There is something quite Radiohead and The Eels about opening track Better Man, indie rock at it's best. Creative, dark and passionate would be a way to describe this strong opener with the lines "And in my disgrace God taught me this, He Loves the sinner, the sinners face. He bore my shame the sinner's replace" being soaked in real meaning. The indie rock sound continues with Could It Be and Stronger, both of these songs I could imagine being played live on a Friday night in a music venue and going down very well with a live crowd. Being a fan of music in the 90's I was a big Oasis and Britpop fan, and Silent Heroes has that vibe, with a guitar riff reminding me of those great times. I really enjoy the track White Horse Rider, I have to admit this album isn't your traditional Christian sounding album, which actually is great a thing. It's raw and different, and a songwriters album. As said, White Horse Rider will not be the kind of song you would hear in a Sunday church meeting, but the lyrics are still very intriguing and powerful and not the obvious words to write about, and that's what I like about this album, nothing is obvious. I love the line "Behold a sharp sword, coming from his mouth, By which he'll strike the nations". Light To My Path has a more mellow middle of the road tempo to it. But for me this is where we get to hear David Paul's unique vocal style flourish. His voice isn't as clean cut as some American worship leaders, and I don't want it to be, there is an honest raw character to his voice which is nice to hear once in a while, especially as it works amazingly well with these songs. I love musicians with character. Another track that shows off the character off this band is the amazing The Camel & The Needle, at times it sounds like a mix between The Stone Roses, The La's and The Beatles during their Sgt Peppers days. The repeated line of "O My Soul march, march, on in strength now" has something very Beatles about it. Even though this track doesn't make my top three, closing track Dayspring will be one of your favorites if you like any of the bands I have mentioned above. Within this album there are a good mix of songs, as I said previously these tracks would go down well in a live venue, it's a kind of songwriters album. What I mean by that is David Paul has been allowed to be himself without falling into a cliched sound or style to create Christian music. If you're looking for something a bit different and indie-rock, and someone who uses a few different styles of rock music, then please have a look at what David Paul & The People are doing.